"... The chapter on proper squat exercise alone is so important that I have already changed the way I teach this exercise in my practice." "... The attention to detail is unparalleled among other texts in the field. If you were going to read and use only one book on weight training, this would be it!" "... Weight Training Without Injury is brilliant—it educates the novice, as well as the professional, on how to train without injury." "A clear and comprehensive guide, backed by scientific evidence and decades of real-life experience. A must-have for anyone needing to weight train safely—which is just about everyone." 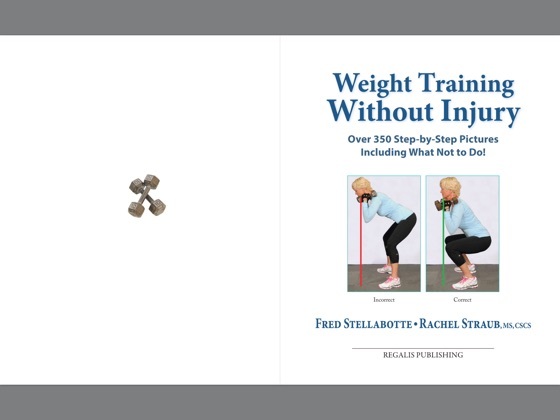 "I absolutely love Stellabotte and Straub's book Weight Training Without Injury! ... It has a strong focus on feet and hand placement, head and neck alignment, spine and hip range of motion, and shoulder and knee joint stability. Science in the weight room—LOVE IT!" "... The methodologies in this book are sound, with scientific backing, and are presented in a very organized and easy-to-read manner. I definitely recommend this book to everyone that wants to train with great technique and excel in their respective fields." "Weight Training Without Injury is an indispensable, user-friendly guide, especially for the beginning lifter ... photos of correct (and incorrect) body positions ... for every step, make it possible to master proper technique when lifting weights..."
Effective and Efficient Weight Training! As a university professor of movement sciences, I frequently call on the phrase “efficiency and effectiveness” of movement. These two outcomes are paramount to a useful and practical exercise program or treatment intervention plan. Weight Training without Injury could easily add “Efficiently and Effectively” to its title. 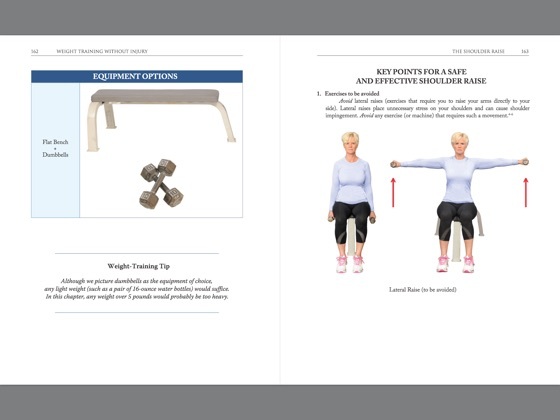 With that said, as the title clearly implies, the focus of this exercise manual is on safety – to guide practitioners and clients alike on the safest recognized approaches to weight training for strength and performance. My first read through of this book had me frequently asking myself “what took so long for a book like this to finally hit the streets! 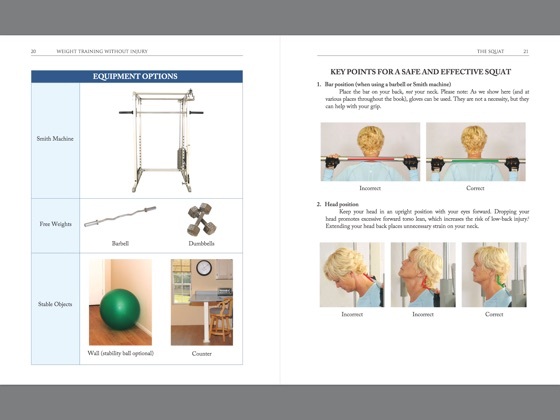 ?” Authors Stellabotte and Straub are to be commended for creating a very useful textbook/manual that Personal Trainers, Exercise Scientists, Coaches, Physical Therapists, Athletic Trainers, Physicians, etc. can use to help guide their clients and patients. And it is written in such clear language with outstanding photographs, that this manual is perfectly suited as a stand-alone for individuals currently engaged in strength training or planning to start a strength training program. 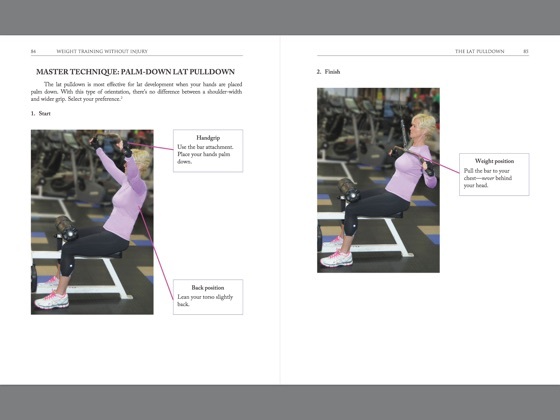 The book is organized into sections that begin with basic information about getting started with strength training. I would call this the efficiency primer – provided simple straight forward guidance to get started. Very much like a “read me first” section of an instruction manual. Section II begins with the legs, with a nice overview of the squat exercise, one of the most common and effective exercises for leg strength and performance. Each subsequent section focuses on a body region, from the legs, to the back, chest, shoulders, arms, and core. The defining feature of this book are the precise and abundant use of photographs of each and every exercise, with colored lines and arrows that clearly identify the correct and incorrect methods of each exercise. Focus is on proper body positioning/posture, how to hold the weights, how to align the machine or other device for resistance. I highly recommend, without reservations, this book for any individual planning to start a new strength development regime; or for the individual who coaches/teaches individuals engaged in strength training. 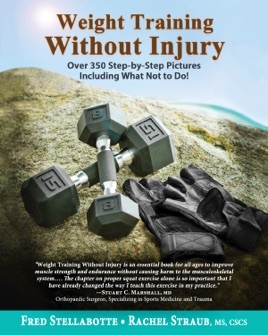 And I especially recommend this book for the seasoned weight training individual – you most likely will identify some potentially injurious patterns in your workout and this book can steer you along a path of continued health and success.